The Runaway Mountain Coaster at Branson Mountain Adventure Park is one of the newest mountain attractions in Branson which offers a unique fun adventure for the whole family. This mountain coaster brings a unique ride experience like you’re riding in a stagecoach in the old west. Billed as the first mountain coaster in the area, the $5 million Runaway Mountain Coaster is located on a steep hillside at the former Butcher Holly property along Highway 165, just two miles from Highway 76. This new attraction in Branson gives every visitor utmost fun, thrill and an opportunity to see picturesque scenery and spectacular wildlife around the Ozark mountains. 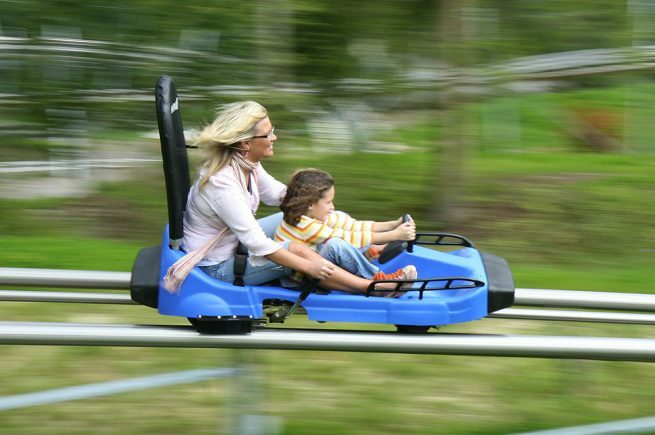 Mountain coasters are now popular in Europe and continue to grow by leaps and bounds in the United States. This mountain coaster is exactly as the name says – a coaster that utilizes the track set on land and travels through natural elevation changes providing a thrilling ride experience around the natural features of the area. Riders are seated individually on the carts that are perfectly built so they can have a safe ride. The carts are pulled to the top of the mountain via the track using chains similar to traditional roller coasters. Once the carts reach the top of the mountain, they are released to travel down the hill, winding in and out and around the hills for a thrilling and unique ride experience. These mountain coasters are specially built to be as unobtrusive as possible so the natural beauty of the area can be preserved while providing a unique outdoor fun in Branson. The mountain coasters are specially designed to allow riders to have control of their ride – with the use of a patented brake system. Riders can choose whether to slow down and take a more leisurely trip down the coaster track or use gravity to the full extent for the fastest and most exciting ride possible. This only means that when you are a roller coaster thrill seeker taking a breathtaking trip with The Runaway Mountain Coaster down the hill featuring spectacular view of the Branson skyline, Branson Mountain Adventure Park will have you covered. Your mountain coaster adventure is actually two adventures in one. You can choose to be a solo driver or a driver and a passenger to pick at the loading station where the expert attendant teaches you how to control your mountain coaster cart. The slow and leisurely uphill ride lets you see spectacular Ozark scenery up close, lets you hear the tweets of birds – and watch other riders on their descent. Once the cart reaches the top of the mountain and ready to be released, you’ll be in control with the ride. When you want to slow down the speed, pull the brake handles or push them forward to speed up. As one of the newest mountain attractions in Branson, The Runaway Mountain Coaster is a great way to enjoy a fascinating coaster ride that takes you to the top of the mountain and travel down the hill.